A greater voice for the people in making government work for the common good is an idea that is powerful and popular, not only in the United States, but as we’re finding out, around the world as well. Recently, in Hong Kong, people have been growing frustrated with the way Beijing has been trying to reduce the role of the people in nominating candidates for elective office. An unofficial group in Hong Kong initiated a referendum on the issue and nearly 800,000 people weighed in. Clearly the people want to be heard. Here in the U.S., citizens are demanding a greater voice for the people as well. So it’s not surprising that when the concept of Citizen Cabinets is explained to Americans, they not only like the idea, they love it. 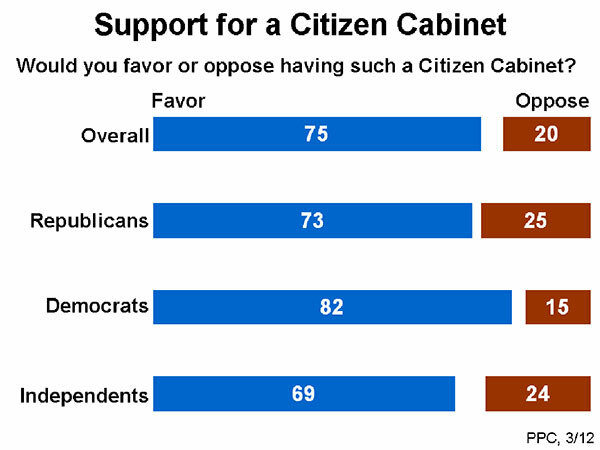 Overwhelming majorities among Republicans, Democrats and independents, from all across the political spectrum, support creating a Citizen Cabinet, and feel it will help improve the situation in Washington.